Auto care is something we take seriously here at Quick Lane at Portsmouth Ford Lincoln, and at Quick Lane at Portsmouth Ford Used Car Center. All of our services are performed by experienced, factory-trained professionals. You can count on our versatility—we can service any vehicle make or model. 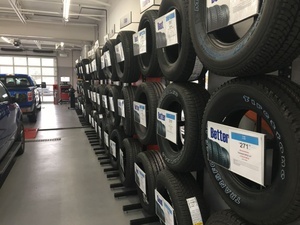 Our shops are designed to meet the needs of drivers who have busy lifestyles and need immediate service for their vehicles. Your car or truck will be taken care of as you comfortably wait. Also, our business hours are structured to work around your schedule, as we are open in the evening and on Saturdays. Our qualified technicians are committed to delivering nothing less than cost-effective services. We want your vehicle to be in optimal condition and to enhance your overall driving experience. Apart from providing friendly and courteous services, we also want you to better understand the needs of your vehicle. We will provide you with a free, 35-point vehicle inspection report every time you visit our shop. This assessment covers as many as 96 individual points on your vehicle so that we know what repairs and adjustments need to be made. © 2019, Quick Lane at Portsmouth Ford Used Car Center. All Rights Reserved.